Sikhs in America today are an energetic community, with a strong sense of public service. From Central Georgia to Southern California, gurdwaras commonly sponsor Red Cross Blood Drives on their premises. The Sikhs of Durham, North Carolina volunteer at local shelters for the homeless. Sikhs participate in the Walk for Hunger in Boston. 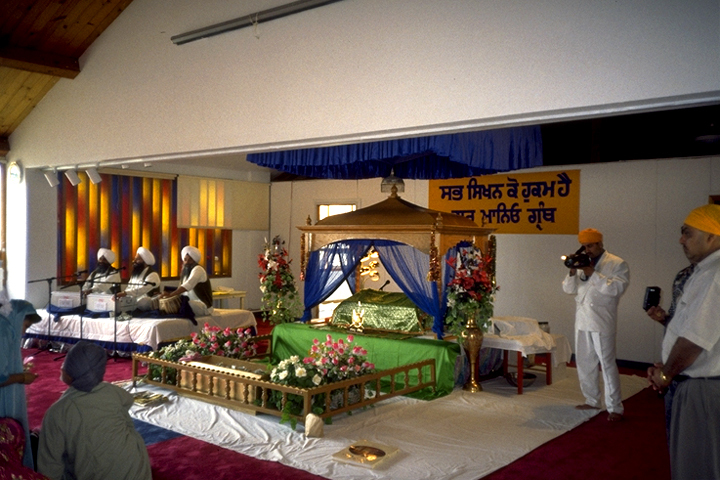 In Los Angeles, Sikhs from some six gurdwaras participated in clean up efforts after the 1992 riots. In 2012, gurdwaras in New York, New Jersey, and Connecticut collaborated with United Sikhs, an international United Nations-affiliated humanitarian and advocacy organization, to provide hot meals to victims of Hurricane Sandy. In cities where interfaith councils have sprung up, Sikhs are invariably active members. Like other immigrant communities, Sikhs are especially concerned with their children. Learning the Punjabi language is considered insurance against total absorption into the dominant culture, yet many Sikh children grow up speaking only English. Most gurdwaras have programs for children to learn the Punjabi language and the Gurmukhi script. 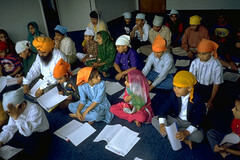 They hold weekend language and religion classes and organize summer camps for Sikh youth. During the gurdwara programs, the hymns and readings of the Guru Granth Sahib are all in Punjabi. To maintain the interest of young people, however, the lectures and talks are often in English. And this struggle to maintain the traditional language is only part of the struggle to maintain a flourishing tradition. Most Sikhs in the United States have made it their permanent home and have become American citizens. They have faith that they can be good Americans, while maintaining their Sikh identity. Even so, Sikhs sometimes experience discrimination because of their distinctive appearance. In the mid-1990s, litigation was launched over the right to wear a turban on a hard-hat job or in the U.S. military. In 2009 and 2010, almost three decades after the Army passed a rule banning “conspicuous” religious articles, three Sikhs were allowed to serve in the U.S. Army with their Sikh articles of faith intact. Two of these Sikhs won commendations for their service in Afghanistan, including the Bronze Star Medal. Most upsetting for many Sikhs is that Americans seem to know nothing of Sikhism, save for a few negative and even violent stereotypes. Sikhs are eager to explain their religious tradition. On the other hand, they do not want to appear to be proselytizing. Sikhs respect the beliefs of others and have never encouraged proselytizing or conversion. Today there are well over 500,000 Sikhs in the United States. While the largest and oldest communities are on the East and West coasts, Sikhs today live in all parts of the country. There is a flourishing Sikh community in Chicago, in Oklahoma City, and in Dallas. In the late 1990s, the Sikh Unity Network, a youth-initiated web resource about Sikhism, summarized the distinctive harmony of American and Sikh ideals: “The Sikh heritage of truth, justice, freedom, and respect for other faiths is consistent with the American traditions articulated so well by Franklin Roosevelt as: freedom of expression, freedom of religion, freedom from want, and freedom from fear.” Today, the Sikh Coalition offers an introductory brochure called “The Sikhs” that is available in eleven languages, in print and online. The brochure is just one of many efforts undertaken by the Sikh community to educate their non-Sikh neighbors about their tradition. The training film “On Common Ground” serves as a valuable tool in educating law enforcement officials, airport personnel, and various communities across United States on cultural and religious practices associated with Sikhism. Awareness of cultural and religious observations, including those of Sikhism, can help avoid misunderstanding and tension – assisting the public in understanding the challenges and realizing the contributions of the Sikh community in America.